This is a one-time thing, part of what we’re doing to start the market garden from a hay field plowed late last November. Unlike at the old farm, where cow manure was well-aged and plentiful, available by the ton, there are so far no animals here. 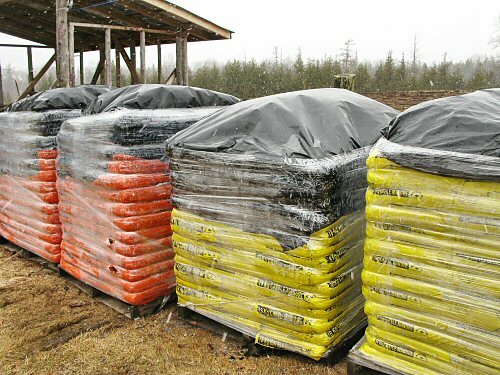 While I like the idea of animal manure, and find DELIVERY kind of odd and offputting, the current reality does force one to really think about hidden costs. The cows at the old farm ate far more hay than the farm produced, which meant buying in, so all of that free, on-farm manure wasn’t exactly free, or on-farm. Factor in the total cost and complicated logistics of raising and selling local beef, and the relatively low return, and manure on a tiny farm can seem quite unsustainable. In any case, maintaining fertility here is a whole new game. Green manure, compost, and a small amount of on-farm manure, from chickens first, are this tiny farm’s future. And today’s delivery is the kickstart. Here we go! Looks like you are going to be very busy putting all those bags down. Good luck! In addition to really liking your photography, I really like the way you think! I’m very interested in your progress at the new place! It’s really interesting, thinking about trying to be a sustainable farm. When you look closely at what you do to build up and maintain good soil, it turns out that one brings in a lot of off-farm inputs. I’m opening a new garden and will be bringing in a lot of fine compost from a local provider in another week. I’m realizing that I can’t produce enough compost for my needs just using the leaves and grass I harvest from my property. Can you say where you ordered the compost? We are about to takeover 1/4 acre urban lot in the Cleveland area, and like you, need to import some fertility to jump start the plot. I’m hoping to have our composting in full swing mid-summer and I’ve got a “plan” to vericompost restaurant wastes in my garage all winter. I really appreciate the information you provide on your blog, it’s great that small farmers can learn together! Dan: Bagged (18kg/40lbs) was the only way we could get certified compost, which we need for organic certification. It should actually work out well, because I think we’ll spread and incorporate in sections as we plant, not try a bigger area like an acre at a time. Fun work on a nice day with the compact tractor, and a couple of people spreading and chatting! Eric: Pefferlaw Soil, here in Ontario. A little far for you! There ought to be some place near you, or maybe there’s a municipal compost facility that delivers by the truckload, that stuff could be good and relatively inexpensive (I need certified, for the organic rules). It’s just too bad the stuff was all bagged up before transport and couldn’t have been delivered via truck unbagged. Good luck getting the new field started! I am not a farmer, but I have purchased a home in Upstate NY that has a barn filled with aged farm animal manure. The barn is large and the manure is almost 2 feet deep. How do I go about selling the compost?